Submission of Abstract closes on December, 20, 2017. 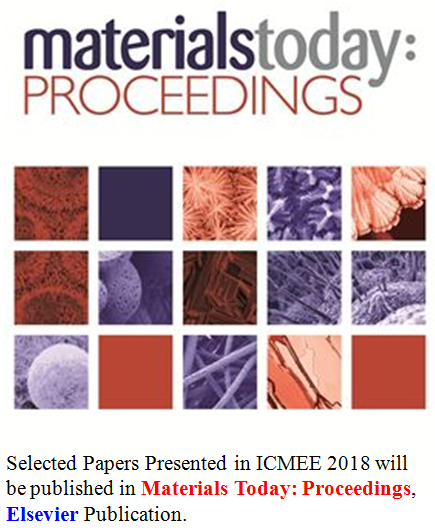 Candidates without abstract can also register and participate after getting prior permission from the conveners Selected papers presented in ICMEE 2018 will be published in MATERIALS TODAY: PROCEEDINGS, Elsevier Publication. Global research initiatives aimed at the crafting of novel and smart materials for energy conversion, production and storage have resulted in promising and sustainable energy technologies. The field is an ever appealing one to young researchers and continues to be a scientific-crowd puller. Environmental concerns on the other hand have propelled research in the direction of exploring and modeling fangled materials for specific applications such as bio-remediation, photo catalytic degradation, toxicity control and eco-conservation. ICMEE 2018 would serve as a platform for world-renowned research groups and aspiring researchers to share, discuss and review innovative findings in energy and environment materials research and facilitate the advent of novel ideas. The current scenario, emerging trends and future directions in the field of applied materials for energy and environment would be extensively deliberated upon and it is anticipated that the congregated inputs of the Conference would benefit the scientific community and society at large. Loyola Institute of Frontier Energy (LIFE), Loyola College, Chennai, Tamil Nadu, India, PIN - 600034.